I hate to admit that I do a lot of lurking in social media. I’m pretty sure I’m not the only person who does this but there is some good to snooping around. I found El Pago online and I invited my friend Morx to come try it out with me. It’s a short ride from my place to the Cubao/New Manila area. The El Pago sign is painted on a wall and next to it is an open door that leads into a small dining area in a home. There are 3 tables and the chalkboard menu, very straightforward. We ordered the Classic, Beef Bacon Cheese and Pulled Pork sandwiches. 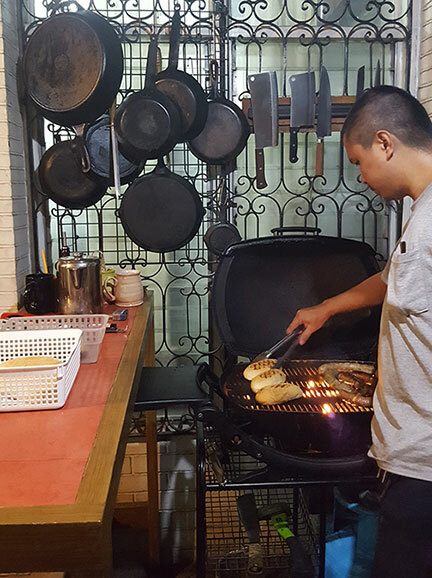 They cook and smoke their sausages in the dining area. It got pretty smoky at some point so if you are sensitive to smoke, it’s better to step outside the house while waiting and walk around the church across the street. Our food arrives and we quickly devour. The Classic is an all pork sausage made with herbs with a little bit of heat, the Beef Bacon Cheese is pretty self explanatory. The sausages were smeared with a house blend of a sweet onion relish, plus we were given a tomato sauce and a spicy sauce. We drizzle both sandwiches with the sauces and it was like a party in our mouths. The bun is also home made, toasted on the grill; with the hybrid softness of a pan de sal/hot dog bun. So good. The sausages were juicy and flavorful. The Pulled Pork sandwich was pretty good as well, very tender slices of pork with pickles and a red sauce that soaks up with the same bread. We were so engrossed eating, we forgot to ask more details about their food. 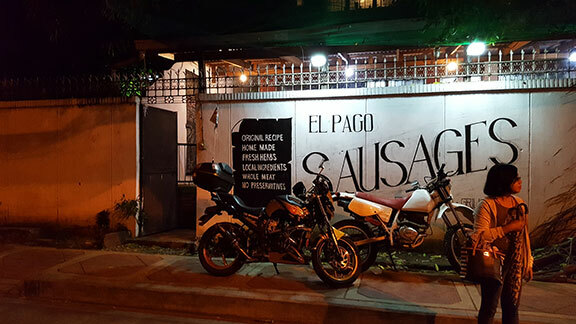 We learned that El Pago has been making their sausages since 2013 but opened their dining space just last year. 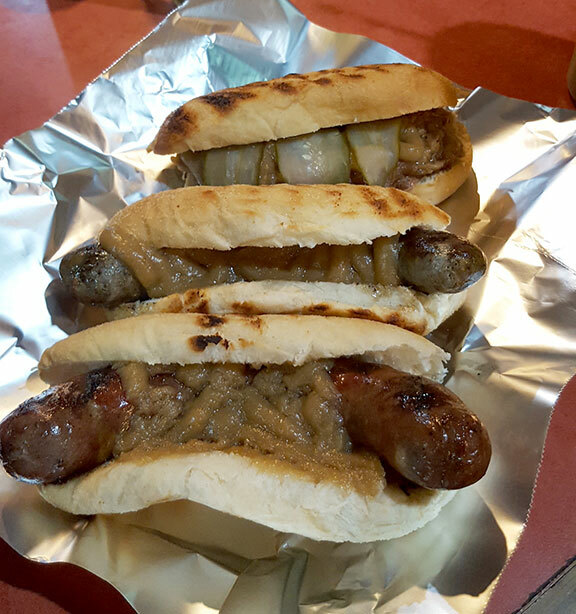 The sausages are all home made, using the freshest ingredients from the market and does not use preservatives. 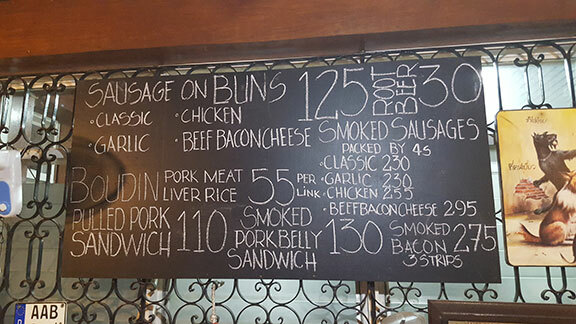 If Cubao sounds like a bit of a trek, they sell their sausages frozen to take home with you. I’ll be back for sure, I’ve got my eye on the Boudin sausages.